When it comes to treating addiction, people have a lot of options. However, one of the best-kept secrets in the rehab industry is how much music therapy can help. It goes above and beyond what traditional therapy can do. In fact, when people mix traditional therapy with music, they have a better chance of beating addiction. Music therapy is a form of treatment that involves playing or listening to music. While the idea seems simple on paper, the benefits of music rehab are vast. Studies show that music positively affects people’s attitudes and emotional levels. Mixing it with traditional therapy can help them overcome addiction faster. Fear plays a big factor when it comes to rehab recovery. People always fear what they don’t know. People often fear going to rehab because they worry about living without drugs and sharing their situations with others. However, music rehab can reduce these fears. Studies show that listening to music and playing instruments builds confidence. As people build confidence, they can tackle their fears head on. Overcoming fear is an important step in avoiding relapse and finding success in daily life. Music can also help people find the root cause of their addiction. This important step is truly necessary to overcome the disease. Failure to deal with the root cause can lead to relapse even after treatment. 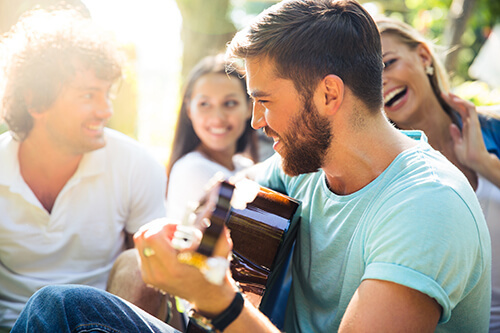 Studies show that simply listening to music can help people open up more quickly during therapy sessions. When they open up, they’re more likely to share their problems and learn how to solve them. Eventually, therapists can determine the root causes of their addiction. We work hard at Woodlands Recovery Centers to find out why people started using drugs and address the issues. Playing and listening to music is a social activity. When people play instruments together they feel a bond or connection that they otherwise may not. This bond is important in building a support system. Having a strong support network makes group therapy more productive. Lastly, music therapy produces a sense of control in people’s lives. When they play instruments, they feel like they’re in control. This is important for those who are new to treatment. It can also speed up the healing process. Music has proven to increase self-esteem as well. People feel more confident when they listen to or play music. It gives them a hobby that they can improve upon and continue after treatment, which generates a positive influence. Don’t let addiction prevent you from living the life that you want. Let music guide you to recovery. Reach out to our friendly staff today at (855) 752-3377 to learn more about our programs, including alcohol addiction treatment.